Summary: Researchers report the ANKRD16 can prevent protein aggregates associated with neurodegenerative diseases. Scientists know that faulty proteins can cause harmful deposits or “aggregates” in neurological disorders such as Alzheimer’s and Parkinson’s disease. Although the causes of these protein deposits remain a mystery, it is known that abnormal aggregates can result when cells fail to transmit proper genetic information to proteins. University of California San Diego Professor Susan Ackerman and her colleagues first highlighted this cause of brain disease more than 10 years ago. Now, probing deeper into this research, she and colleagues have identified a gene, Ankrd16, that prevents the protein aggregates they originally observed. Usually, the information transfer from gene to protein is carefully controlled–biologically “proofread” and corrected–to avoid the production of improper proteins. As part of their recent investigations, published May 16 in the journal Nature, Ackerman, Paul Schimmel (Scripps Research Institute) My-Nuong Vo (Scripps Research Institute) and Markus Terrey (UC San Diego) identified that Ankrd16 rescued specific neurons–called Purkinje cells –that die when proofreading fails. Without normal levels of Ankrd16, these nerve cells, located in the cerebellum, incorrectly activate the amino acid serine, which is then improperly incorporated into proteins and causes protein aggregation. “Simplified, you may think of Ankrd16 as acting like a sponge or a ‘failsafe’ that captures incorrectly activated serine and prevents this amino acid from being improperly incorporated into proteins, which is particularly helpful when the ability of nerve cells to proofread and correct mistakes declines,” said Ackerman, the Stephen W. Kuffler Chair in Biology, who also holds positions in the UC San Diego School of Medicine and the Howard Hughes Medical Institute. 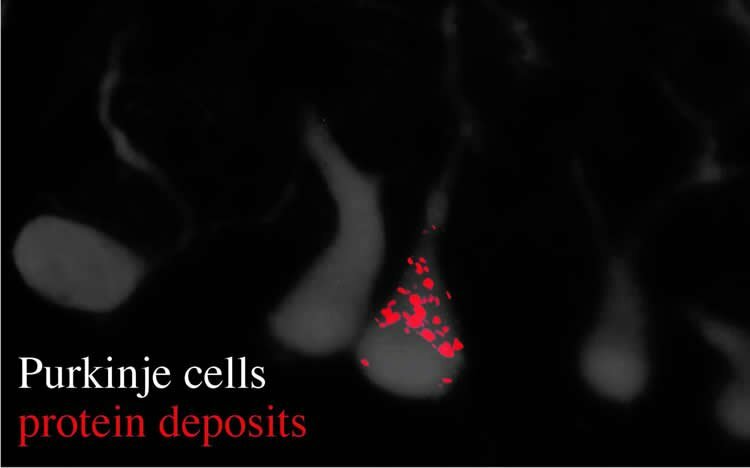 Image reveals Purkinje cells (gray) and their dendrites, as well as an accumulation of protein deposits (red dots). NeuroscienceNews.com image is credited to Ackerman Lab/UC San Diego. Funding: The research was supported by the Howard Hughes Medical Institute, the National Institutes of Health (R01NS42613, R01GM072528 and R01CA92577), and a Fellowship from the National Foundation for Cancer Research. Image Source: NeuroscienceNews.com image is credited to Ackerman Lab/UC San Diego. Original Research: Abstract for “ANKRD16 prevents neuron loss caused by an editing-defective tRNA synthetase” by My-Nuong Vo, Markus Terrey, Jeong Woong Lee, Bappaditya Roy, James J. Moresco, Litao Sun, Hongjun Fu, Qi Liu, Thomas G. Weber, John R. Yates III, Kurt Fredrick, Paul Schimmel & Susan L. Ackerman in Nature. Published May 16 2018. UCSD “Gene that Helps Prevent Brain Disease Identified.” NeuroscienceNews. NeuroscienceNews, 16 May 2018. UCSD “Gene that Helps Prevent Brain Disease Identified.” http://neurosciencenews.com/neurodegeneration-genetics-9070/ (accessed May 16, 2018).